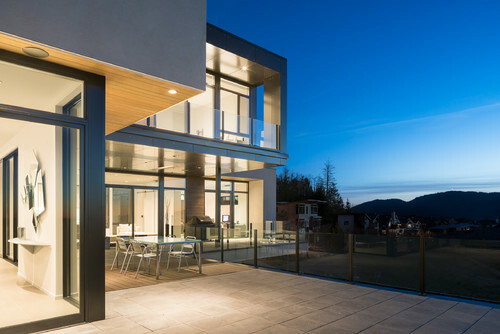 A family relocates to a contemporary jewel box built into a sloping site with beautiful views. 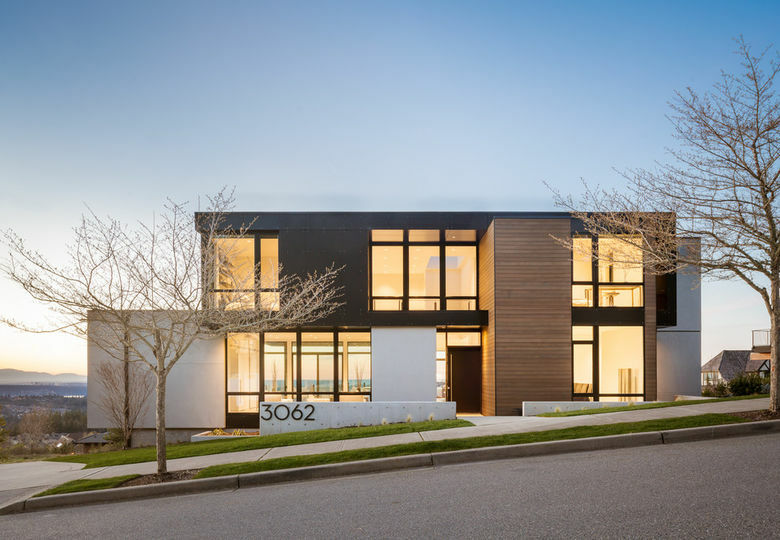 When a couple with two teenagers moved from Chicago to Seattle to build a new house in the Issaquah Highlands, they sought out architect Ryan Stephenson for his modern, minimalist approach to design. They asked for a home with lots of natural light, plenty of open and usable space and a clean, unobstructed flow. They also wanted decks to take advantage of the sprawling hillside views. The basement, in fact, is buried into the hill on one side and completely open on the other. The exterior is a combination of stucco and concrete, clear cedar and matte black aluminum composite panel. The front door and foyer open to a sculptural steel stair that leads to the lower level and upper level. Behind the stair off the foyer is the formal dining room. Off to one side of the stair is a sitting room leading to a study. To the other side is the galley-style kitchen with lots of storage. 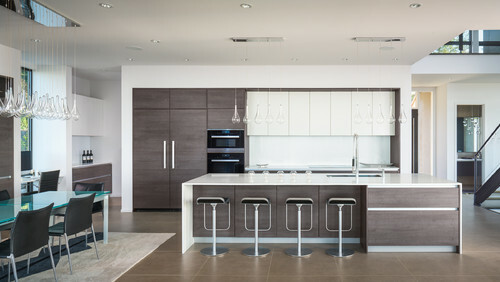 The kitchen cabinets are by Leicht and feature dark walnut veneer. The homeowners brought all of their existing furniture to their new home in Seattle. Stephenson designed the house to accommodate those furnishings. The kitchen, living and casual dining areas are all open to each other, with large windows bringing in light and views. The window systems are Andersen E-Series with black aluminum exteriors and painted black interiors. On the kitchen’s storage wall, the cabinets’ clean fronts without handles continue the home’s minimalist aesthetic. 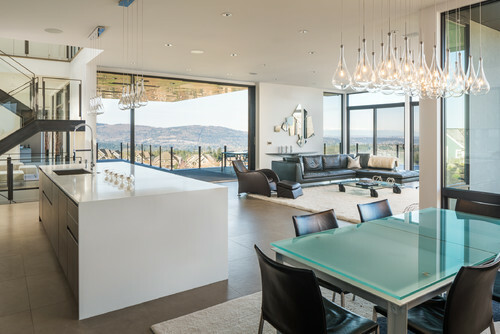 The countertops are white Caesarstone. The formal dining room includes shelving for the family’s accessories and art. Flooring on the main level are large tiles that mimic concrete. Beyond the stair is a sitting room leading to the study. Decks on the first level provide shelter via large overhangs with gas heaters embedded in the ceiling. “They wanted to be able to enjoy the outdoors on drizzly fall and spring days,” Stephenson says. Precast concrete pavers were used for deck flooring. 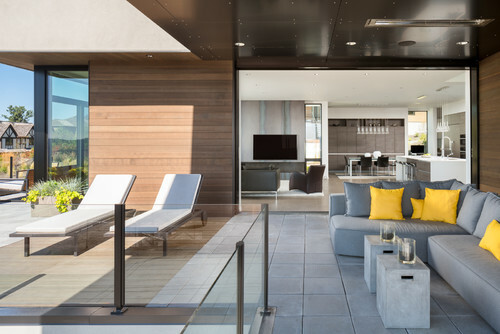 The patios extend the living space and create a seamless transition between inside and out. A fireplace of cold-rolled steel in the living room stretches along the length of the wall, with the fireplace opening on one side and the TV mounted on the other. Cabling for the house’s many audio and visual devices is housed off to the side to keep the walls free of clutter. Other areas of the deck are fully open to the sun and are next to covered patios that extend the living areas to the outdoors. Above the stairway is a skylight. The floor treads are walnut. Out the window the second story becomes level with the slope, a strategy that reduced the house’s massing. The simple master bedroom has Fleetwood glass doors leading to an upper-level sun deck. 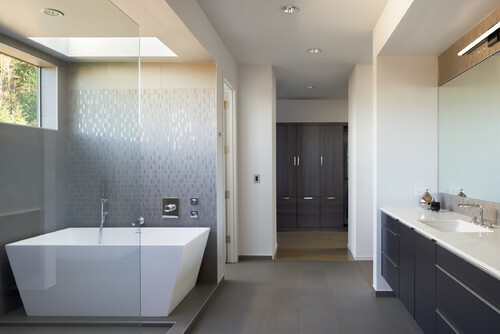 The master bath includes a square-ish freestanding tub next to a glass-paneled shower. The cabinetry is from Leicht. The minimalist home has many casual areas for enjoying family, friends and the outdoors.